Open Bar? Yes Please! ANOTHER Open Bar THIS Friday?! That Sounds Like Disaster! 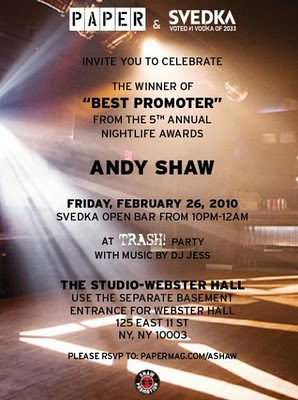 10:50-12:00 pm- "Best Promoter" Party for Andy Shaw at the Studio at Webster Hall. 12:01- Head home, you've had a long night! Don't forget all thse parties do require an RSVP so get on it! Hope to see you out and about! FourSquare me! Invite courtesy of Socially Superlative.